“Wow – we’re here on this stage right now,” said a flabbergasted Macklemore. 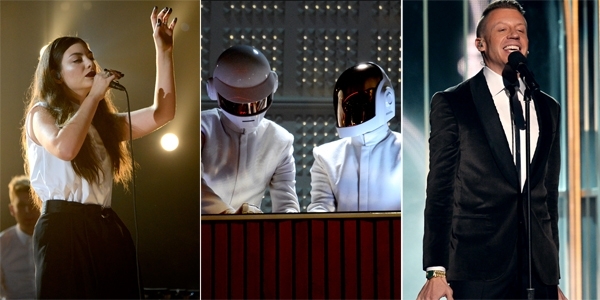 Daft Punk made great strides for robotkind at the 2014 Grammys when the French electro duo earned themselves five trophies, including Album of the Year for Random Access Memories and Record of the Year for the irrepressible “Get Lucky.” Other big winners at the performance-heavy awards ceremony in Los Angeles included Macklemore and Ryan Lewis, who took home Best New Artist, three rap trophies and heaps of credit for allowing 33 couples to wed during their set, and current Rolling Stone cover star Lorde, whose single “Royals” earned her Song of the Year and Best Pop Solo Performance and left her practically speechless both times. Some of the night’s best speeches were merely interpretations of what the circuitry inside Daft Punk’s robots might be thinking. Pharrell took a shot when the group won Best Pop Duo/Group Performance for “Get Lucky.” “Dude, on behalf of the robots, man, [censored bleep] thank you, thank you, thank you.” One of the androids clacked its metal hand in gratitude. Later, Pharell mused on who the robots “would like to thank,” but trailed off and just gave it up for the “incredible” Nile Rodgers. Beyond shiny new sippy cups, the evening’s many unique collaborations stole the show. Robin Thicke found a way to make “Blurred Lines” even hornier with a little help from horn-loving classic rockers Chicago. Daft Punk, dressed in white spacesuits, acted as engineers in a staged recording studio for the likes of Pharrell, who sang “Get Lucky,” Nile Rodgers, who let his “Le Freak” flag fly, and Stevie Wonder, who sang circles around all of them with some lines from his 1977 disco-y hit “Another Star.” Pink upped the show’s surrealism levels by dangling herself over the audience and dipping down to a shirtless muscleman before singing “Just Give Me a Reason” with fully clothed fun. frontman Nate Ruess. Miranda Lambert and Billie Joe Armstrong twanged along to the Everly Brothers’ “When Will I Be Loved.” Kendrick Lamar and Imagine Dragons banged the drum quickly in a mash-up of the rapper’s “m.A.A.d. City” and the rockers’ “Radioactive,” in a way that got rap-rock originator Steven Tyler riled. The Highwaymen performed with Blake Shelton in the absence of Johnny Cash, and even got some of the longhaired hippies in the audience approving of Merle Haggard’s anti-hippie screed “Okie From Muskogee.” Metallica found a way to make its war anthem “One” even more explosive, thanks to some expressive pianism by classical musician Lang Lang. And the night’s finale – a supergroup of Dave Grohl, Nine Inch Nails, Queens of the Stone Age and Fleetwood Mac’s Lindsey Buckingham – gave a psychedelic edge to NIN’s “Copy of A” and Queens of the Stone Age’s “My God Is the Sun,” before advertising ended the set.